Celebrating centuries of traditional British design, the Heritage Houndstooth large dog bed is a classic design with a twenty first century twist. With a vibrant modern splash of colour, the Heritage Houndstooth box duvet offers style, comfort and durability. A classic Houndstooth design featuring traditional green and browns with a burgundy faux suede. Fully washable. 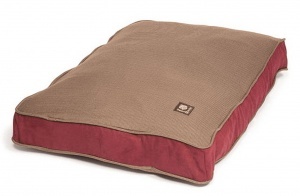 and deep filled with supersoft thermal polyester fibre providing softness, warmth and comfort.